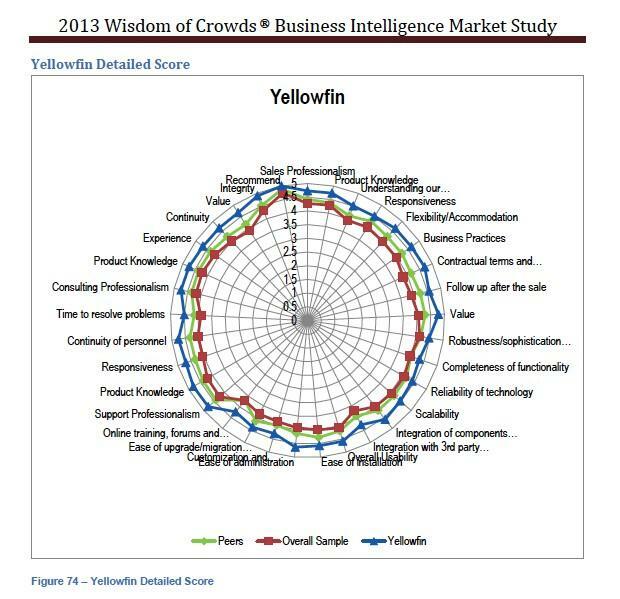 Join Yellowfin as we dissect the results of 2013’s Wisdom of Crowds Business Intelligence Market Study – the BI industry’s most in-depth research report into major global implementation, usage and technology trends and developments. But seats are limited, so reserve your free spot today. Register Now! There are three concise 40-minute Webinars scheduled throughout Monday 15th and Tuesday 16th July for your convenience. Move beyond the pomp and fanfare. Let Yellowfin help you understand how to harness the industry knowledge you need to safeguard your own BI success. Attendees will receive a free copy of Dresner Advisory Services’ (DAS) 2013 Wisdom of Crowds BI Market Study. "If understanding how to capitalize on market trends and the consumerization of BI – to empower more people with understandable and actionable information – is important to you and your business, then this Webinar is a must." "Our annual BI study goes far more in depth than other market reports, thus enabling readers to understand the nature and rate of change in the market and to better determine what is real and what is hype. "I’ve been focused on Business Intelligence for nearly a quarter of a century and I’ve never been more excited about the industry than today… Enter mobility, collaboration, cloud, visualization, big data and social – It’s nothing short of a Business Intelligence Renaissance!" Please note: After registering, you will receive a confirmation email explaining how to join your chosen Webinar.